I received this idea about how to make your own vertical laundry sorter from Valerie, who shared it first on Household Management 101's Facebook wall, and graciously consented to let me put it up on the site so more people could see it. My laundry room is only 5ft x 6ft, so I have VERY limited space. So I came up with this! The kids sort their own laundry once a week. Once the bin is full, that's pretty much one load (unless someone keeps cramming it in there - then its 2 loads. lol). We've done it this way for about 5 years, since the kids were almost 3 and 5 years old. Valerie, thanks so much for sharing this idea with everyone. It is another great way to save space in a cramped area, but still have a laundry sorter so you sort clothes as you take them off, which saves a step later during the laundry cycle. the bins on top. That is why these bins are ideal. 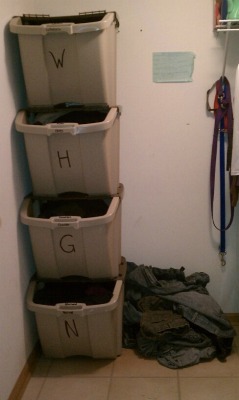 Valerie, I see that you labeled the bins with a permanent marker to help your kids know which bin to throw things in. That is a great touch, and makes it easier for your kids to remember what to do! Then, the only trick is training them to remember if something has to be washed in hot, gentle, etc. since you are sorting that way. Although that may sound like a difficult task to others who are reading this, I know it can be done. For example, my little 3 year old knows what stuff goes in the special basket to be washed gently or separately from other items. You just tell them a couple of times. Kids are a lot smarter than we give credit for, in my opinion, anyway! To make it even easier though when we sort, I just have them typically sort by color (whites, darks, brights and reds). There are, like I said, some items with special washing instructions, but I typically try not to buy stuff that we have to wash specially, because that just makes more work for me. Therefore, this sorting system works pretty well for us. Do you have any creative organizing ideas like Valerie? If so, please share your creative storage solutions and organizing ideas here, or read others that have already been submitted. Valerie, what a great "invention". My laundry is also very small and I googled "vertical laundry sorter" and this came up. Unfortunately, I'm in Australia and cannot find a comparable bin like those you used. I wonder if there are any Australian readers who have seen these somewhere? This is a great idea. I have limited vertical space as well, but it is in my main hallway. I love the concept but would really like to have something that looks nice AND is functional. Any ideas on what other containers to use that would look better than the plastic tubs? Q. How do you remove just one bin for washing? for example, suppose everyone needs socks and I need to pull out the bin for whites but it's the bin halfway down? Is there a way to remove and put back without disturbing tower or does tower have to be disassembled to get at what you want? Use square bushel-size laundry baskets, mounted on heavy-duty hooks at the back. Leave 6" clearance between the bottom of one basket and the top of the next, with about a 2" clearance between the floor and the bottom basket. These baskets will left off the hooks, and they are openwork, so laundry doesn't get smelly (think socks).